NFCufflinks from CR Threads (Computer Readable Threads) are cufflinks embedded with near field communications (NFC) technology – NFC cufflinks. 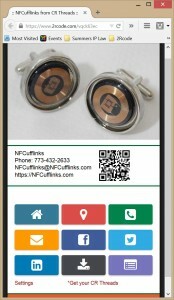 NFCufflinks and other NFC apparel from CR Threads provide user contact tools that allow users to customize a mobile landing page for each NFCufflink and/or piece of NFC apparel. 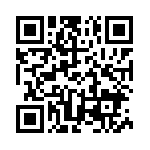 Standard contact actions include URL redirect to a website, Map latitude / longitude of your business, initiate a phone call to you, initiate an email to you, redirect to your Facebook page, redirect to your Twitter page, redirect to your Linkedin page, download a document of interest, and download your Vcard. The Topaz 512 NFCufflinks from CR Threads (Computer Readable Threads) use silver tone round recessed cufflink settings embedded with Topaz 512 near field communications (NFC) technology – NFC cufflinks. NFCufflinks and other NFC apparel provide contact features to facilitate business and social networking, including a mobile landing page for each NFCufflink that may be configured with various contact and communications icons for user selection. *Please contact us to discuss customizing the contact actions for you to include additional contact methods (e.g., YouTube, Voting and Surveys). Use NFCufflinks and other NFC apparel for any number of practical solutions, including memorialize an event by redirecting to a video or multimedia content, network with clients, deliver marketing and advertising material in a unique way. CR Threads © 2015. All Rights Reserved.